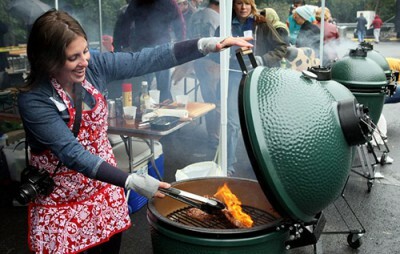 The Big Green Egg is a truly versatile and fun piece of cooking equipment. Your friends and family will be amazed when you fire it up in the morning to make a great make-ahead breakfast. I like blueberries, and they were beautiful the day I made this for the first time, so they are in the recipe. But if they don’t look good that day or you like strawberries better, go for it. Even bananas or peaches would work. Just be sure the casserole gets cooked in the middle and it will be great. From Ray Lampe’s Big Green Egg Cookbook by Ray Lampe/Andrews McMeel Publishing, LLC. Photo by Angie Mosier. The night before you plan to cook, tear each bread slice into 9 pieces and put the pieces in a large bowl. Add the sausage and toss to mix. In another large bowl, beat the eggs until frothy and blended. Add the butter and whisk until blended. Pour the egg mixture over the bread mixture. Using a large spoon, gently fold them together until the bread is evenly soaked. Spray a 9 by 13-inch EGG-safe pan with vegetable cooking spray. Pour the bread mixture into the pan and spread it evenly. Sprinkle the blueberries over the top, distributing them evenly, and then push them down into the bread mixture just to hold them in place. Cover the casserole and refrigerate for at least 4 hours and up to 24 hours. In the morning, take the casserole out of the refrigerator to warm at room temperature for 1 hour. Prepare the EGG to cook indirect with the convEGGtor at 350°F/177°C. Uncover the casserole, place it on the EGG cooking grid, and cook for 30 minutes. Spin the casserole 180 degrees to ensure even cooking and continue cooking for another 25 to 30 minutes, until the casserole is firm and set in the middle. Remove from the EGG and let rest for 5 minutes. Serve with maple syrup on the side. Does the milk and Half & half get added the night before or with the egg mixture? Am I missing it? What about brown sugar, vanilla, salt? Looks good, missing some steps though – do you add the half-half, vanilla and milk to the egg mixture?